Some dogs love to be by their owner’s side, especially if they’re elderly or sick. Many people carry them around with them, but it’s hard to do other things while holding your pet. Pet slings are the perfect solution. The 4 Lazy Legs Sling is a well-made sling, offering both you and your pet complete comfort. It’s nice to be able to carry them with you while you do housework, run errands, etc. Some pets just don’t do very well in carriers because they feel encaged. This sling will allow you to carry them, and they will be comforted because they will be with you, and they will be snug, but not crowded or surrounded by material. In this review of the 4 Lazy Legs Adjustable pet sling, we will talk more about how pet slings work, and we will explain how it’s made. We will talk about how to use one safely, and share what customers have to say. We will also tell you where you can buy one at an affordable price. CLICK HERE to Read Reviews, Check FAQ’s, and to Buy this Sling on Amazon! 1.1 What Are the Advantages & Disadvantages? There aren’t many pet slings, but this one is made very well and allows you to carry your pet with you whenever you want. Whether you are doing household chores or running errands or going for a walk, you can take your pet with you, and you will be able to use both of your hands again. Not too many people know that feeling unless they try to do everything while holding their pet in their arms. This sling makes carrying your pet easy. It is very strong and is made of 100% cotton canvas. It is also machine washable, which is a plus. Because it is cotton, it is a bit softer than regular canvas. 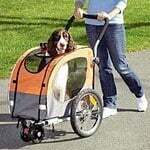 While you can’t use it for big pets, it is great for small dogs and cats, as long as they’re under 30 pounds. Many times, your pet will look out of the sling, which is why there is a tether clip. It is best to use this clip to attach to your pet’s harness, instead of a collar. If anything were to happen, your pet wouldn’t hurt its neck, and the harness will keep them securely in place. Made with 100% heavy duty cotton canvas material. Has a padded shoulder strap. A tether clip is included to ensure safety. The edges of the sling are also padded, for the comfort of your pet. The sling has drawstrings that allow you to ensure that your pet fits snugly. Your pet’s body weight distributes evenly in the pouch. Not suitable for pets weighing over 30 pounds. Some people have a hard time figuring out how to use the drawstring. CLICK HERE to Buy the 4 Lazy Legs Adjustable Pet Sling on Amazon! The description on the sales page says that it is one-size-fits-all, but this isn’t the case. No product is perfect for every cat or dog. Two dogs can weigh 20 pounds, but one may be a small or toy breed, and the other may be a puppy of a larger breed. Please be sure to measure the length of your pet, because they may be too long to fit properly in a sling. 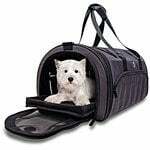 If your pet is too long, you can use a comfortable carrier, such as the Argo pet carrier. This carrier has longer handles so that you can carry it on your shoulder with no problems at all. A regular carrier would also be best for rabbits, Guinea pigs, ferrets, etc. These pets tend to jump, and unless your pet is very sedated, it could be dangerous to carry them in a sling. Customers who are using it are saying how much more comfortable they and their pets are using this sling. 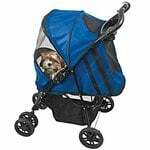 They say that their pet fits snugly in it, and the harness attachment makes them feel much safer. Also, the shoulder strap is padded, taking stress off of their back and shoulders. When you are walking around a lot with your pet on your shoulder, this padding makes a world of difference. The pets are snug and comfortable and are happy to be with their ‘parents.’ This is a great purchase for when your pet is elderly and wants to cuddle by your side all of the time. Some pets are just very attached to their owners, and like to stay underfoot, which can be very dangerous, especially while in the kitchen, or going up or down the stairs. If you work out of the home during the day, your pet probably does this to you. The pet sling is a great way to keep them close to you, without putting either of you in danger of getting hurt. Slings are also nice because they are open, and you can always pet them. It’s so much easier to comfort and make a fuss of them in a sling because it is already open. There are no zippers to fuss with, and your hands are both free. CLICK HERE to Purchase the 4 Lazy Legs Adjustable Pet Sling on Amazon!